The Spanish imperial eagle (Aquila adalberti) is found only in the Iberian Peninsula and is considered one of the most threatened birds of prey in Europe. Here we analyze lead concentrations in bones (n = 84), livers (n = 15), primary feathers (n = 69), secondary feathers (n = 71) and blood feathers (n = 14) of 85 individuals collected between 1997 and 2008 in central Spain. Three birds (3.6%) had bone lead concentration > 20 μg/g and all livers were within background lead concentration. Bone lead concentrations increased with the age of the birds and were correlated with lead concentration in rachis of secondary feathers. Spatial aggregation of elevated bone lead concentration was found in some areas of Montes de Toledo. Lead concentrations in feathers were positively associated with the density of large game animals in the area where birds were found dead or injured. 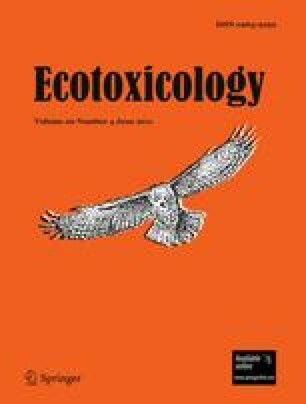 Discontinuous lead exposure in eagles was evidenced by differences in lead concentration in longitudinal portions of the rachis of feathers. Lead analyses performed at IREC were funded by a grant of the Spanish Ministry of Science (CGL2007-62797). P. Acevedo is currently holding a Juan de la Cierva research contract awarded by the Ministerio de Ciencia e Innovación—Fondo Social Europeo and partially by the project CGL2009-11316—FEDER. Use of trade, product, or firm names is for descriptive purposes only and does not imply endorsement by the U.S. Government. Comments provided by C. Bunck, J.C. Franson and C.J. Johnson were appreciated. We would like to thank to EL Organismo Autónomo de Espacios Naturales de Castilla-La Mancha and EL Centro de Estudios de Rapaces Ibéricas.